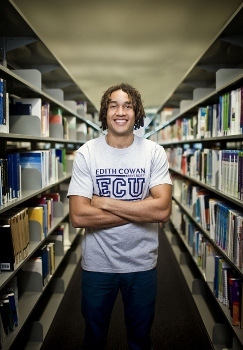 Edith Cowan University encourages students to strive for personal excellence in all aspects of their life. The University recognises and promotes the value of combining both sporting and academic aspirations. This is why ECU is a member of the Elite Athlete Friendly University (EAFU) network. As an Elite Athlete Friendly University, ECU has an agreement with the Australian Sports Commission to support elite athletes in achieving and balancing both their academic and sporting pursuits. There are currently many elite athletes studying at ECU who are engaged nationally and internationally in a broad range of sports including, AFL football, water polo, soccer, netball, athletics, swimming, cycling, golf, rowing, volleyball, hockey and wheelchair sports. ECU understands that athletes require increased support to successfully integrate their studies while training and competing. As a result, athletes under the Elite Athlete Program (EAP) at ECU may be able to negotiate their study options related to enrolment and assessment. access to off campus study materials and class notes for missed lectures, tutorials and practicals. recognition of credit achieved at interstate universities. Athletes registered under ECU’s EAP (and currently enrolled in an ECU course of study) may be eligible for free membership to the ECU Health and Fitness Centres (available on the Joondalup and Mount Lawley campuses). Consideration will also be given to students who are national representatives in international sporting events. Other levels of representation such as State representation will be considered on a case-by-case basis. Currently in Year 12 and interested in studying under the EAP at ECU? ECU recognises that training and/or competition for an elite student-athlete may affect their academic performance during year 12. Elite athletes intending to apply for study at ECU are encouraged to submit a letter for special consideration to the Director of Student Services. Athletes may be granted concession on this basis. How can I apply for the EAP? As outlined in the EAP application, please include a letter from your state or national sporting body confirming your selection into the sport. All applicants will be notified as to the outcome of their application within 14 business days.